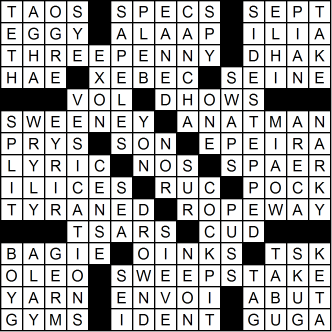 Welcome to Word-Buff's latest Feature Crossword Puzzle. If this is the first time you've been here, there are a few things you should know about my puzzles before diving in. So beginners, scroll down to About the Feature Crossword... just below the puzzle grids. If you're an old hand, what are you waiting for? Your time starts NOW! The test password I use for this page is ... wait for it ... wordbuff. Want to print out any previous feature puzzles? Just visit the crossword archive right here. In case you haven't noticed, I have a soft spot for Scrabble. And I know that Scrabble players - even the ones who love crosswords - really hate seeing words that are not allowed in their beloved word game. The reason for this, of course, is that seeing a word can cement it in the brain leading a player to play a phoney in a Scrabble game. So, to take care of my precious herd, in my puzzles I have made sure that every single answer is a valid Scrabble word! That's right - each and every clue in my feature crossword has an answer that can be found in the Official Scrabble Dictionary. If a clue consists of a sequence of uppercase letters separated by hyphens, the answer is an anagram of that word. The answer to the clue T-R-I-G-L-Y-P-H-S, for example, is SPRIGHTLY, since this word is the only anagram of these letters.